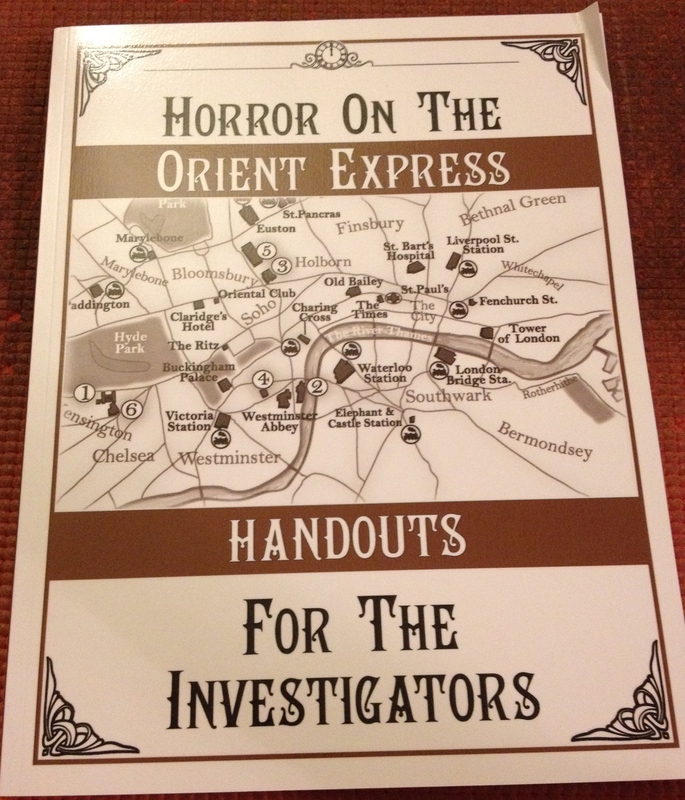 Unboxing: Horror on the Orient Express – Part One! 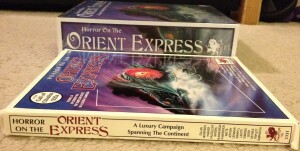 On 12/27, the first part of my Horror on the Orient Express pledge arrived, and since we’ve covered the re-release of this classic Call of Cthulhu campaign so much, I thought I’d do an unboxing for you, our Diehard GameFAN readers. Now, I say first part because things like my Mugs, physical copy of the Keeper’s Screen, miniatures to paint and so on arrive in 2015, so we won’t get to cover any of that until the new year. 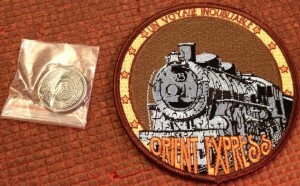 A few of these will be repeats of the beta/prototype ancillary items for Horror on the Orient Express that we looked at in January, but a lot of these are brand new. 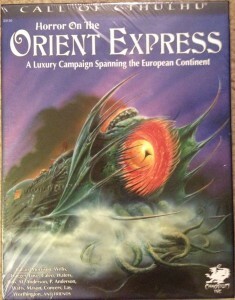 For those of you looking for commentary on the actual content of the collection, let me give you the following links that actually go in-depth (perhaps too much) into the adventures that make up Horror on the Orient Express. 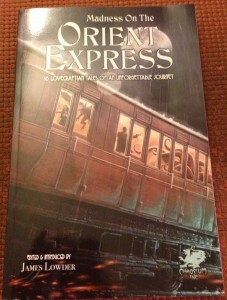 My review of the digital version of Horror on the Orient Express. 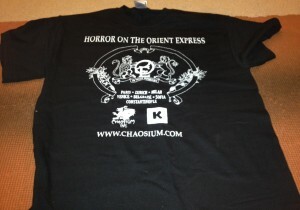 Now for those of you who just want pictures, let’s delve into everything Chaosium sent me. Remember, you can click on each photo for a larger version of the image. Each of those photos will be a couple of megs, so just a heads up in case you’re on your cell or tablet. 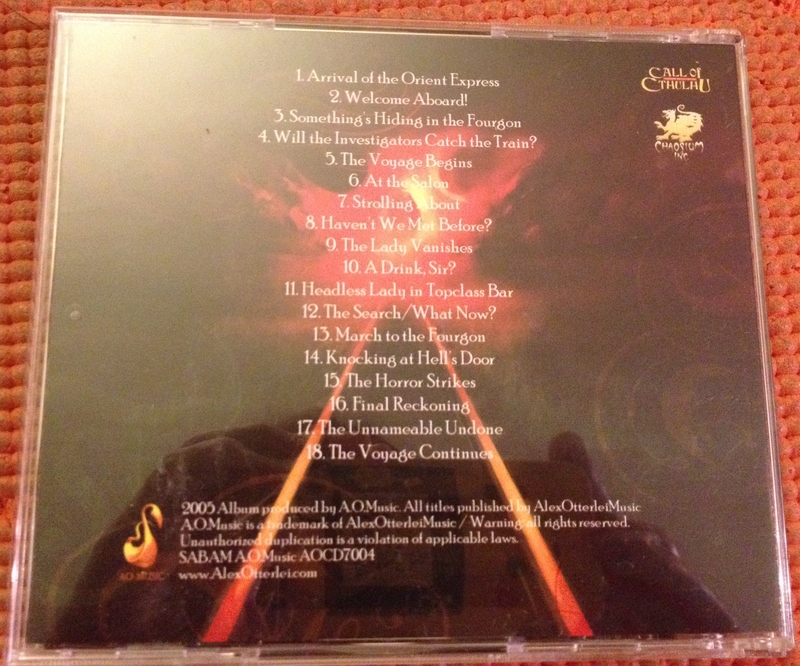 Here is the package as it came directly from Chaosium. This is a big box that cost them $18 to ship. 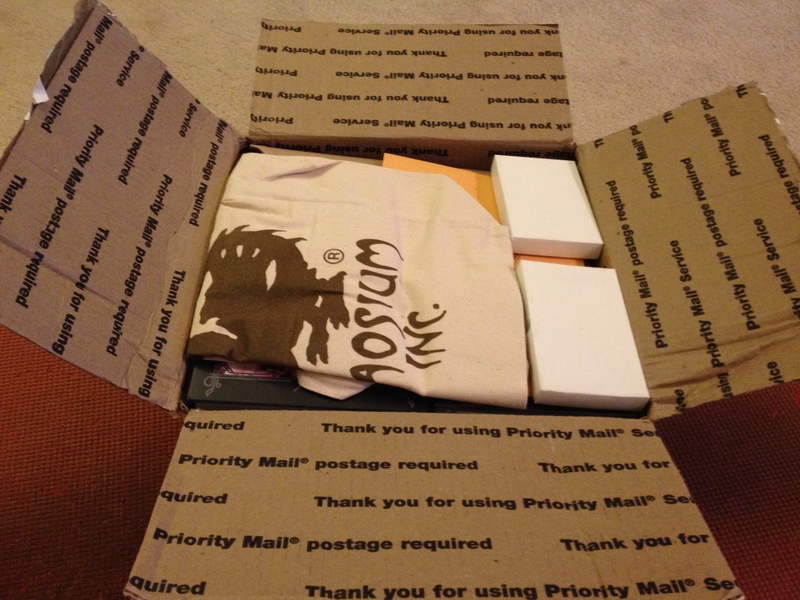 Man, I hope Charlie and his crew profit off this thing, especially with the double shipping and extras they gave out with the time delay. First up – a lovely Chaosium tote bag that will be joining countless others that we use to do grocery shopping with. 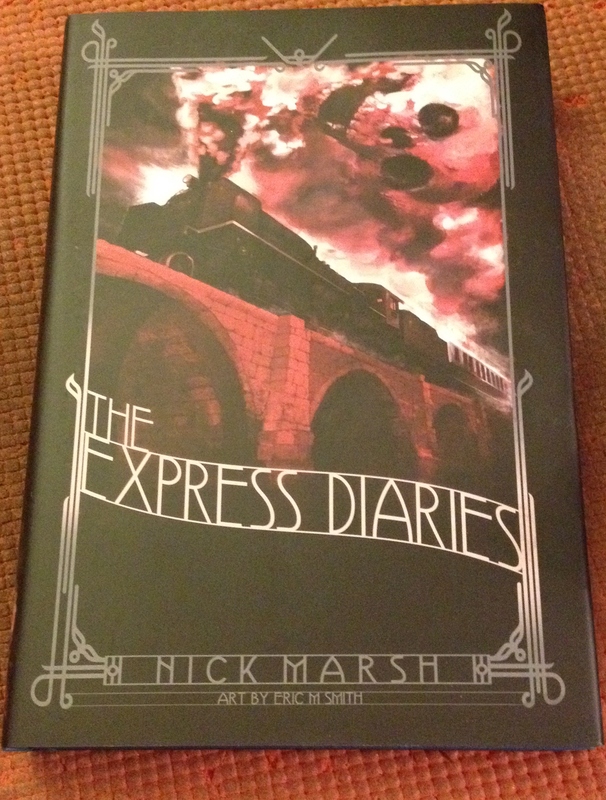 Next up a copy of The Express Diaries. 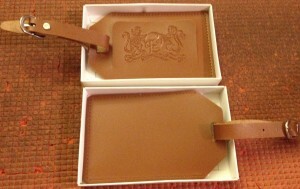 I have this for my Kindle, but I’ve been waiting for the real thing to arrive. Ooh, it’s pretty. It’s too bad I missed out on the IndieGoGo campaign for that, but then again, I’ve never had a good experience with IndieGogo, be it Titan Forge miniatures or DC Comics. An envelope and some boxes. What could be inside? The back of the envelope. 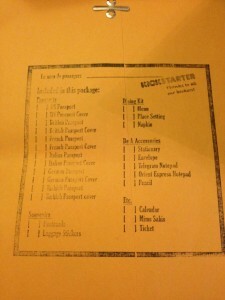 Things should be checked off for the specific Kickstarter backer, but they weren’t on mine. 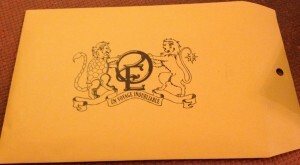 Here is what is inside the envelope. 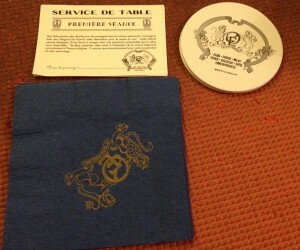 Some napkins, coasters and place cards. Cute. 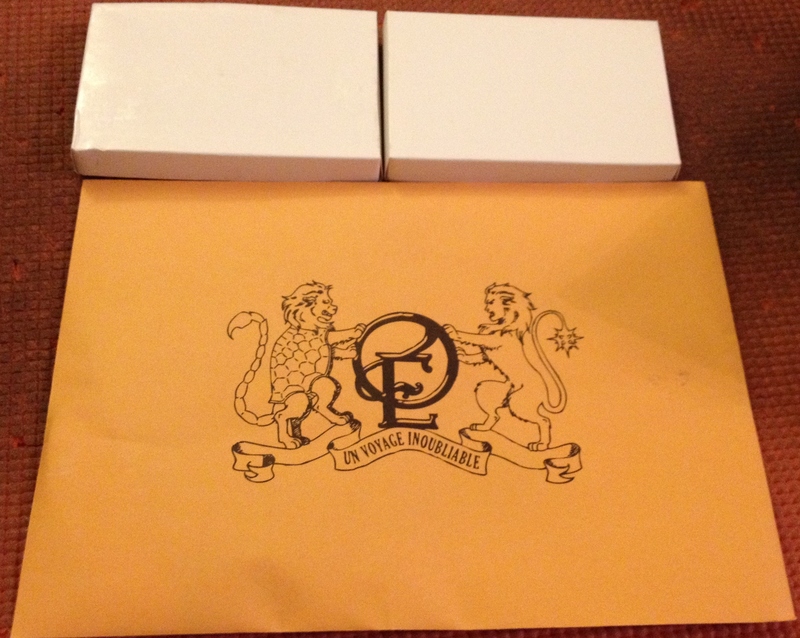 Inside the boxes were luggage tags. 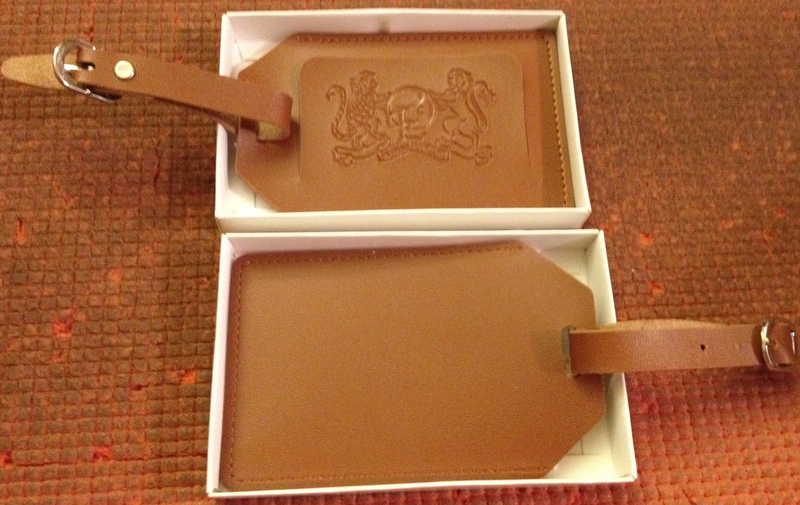 One shows the front and one shows the back. These are just in time for the anniversary trip my wife and I are taking to Snoqualmie and North Bend in February. 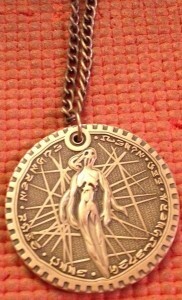 Twin Peaks and Cthulhu. That can’t possibly be a horrific combination, right? Another book. This time it’s Madness on the Orient Express. You can read my review of that anthology (which is fantastic) here. 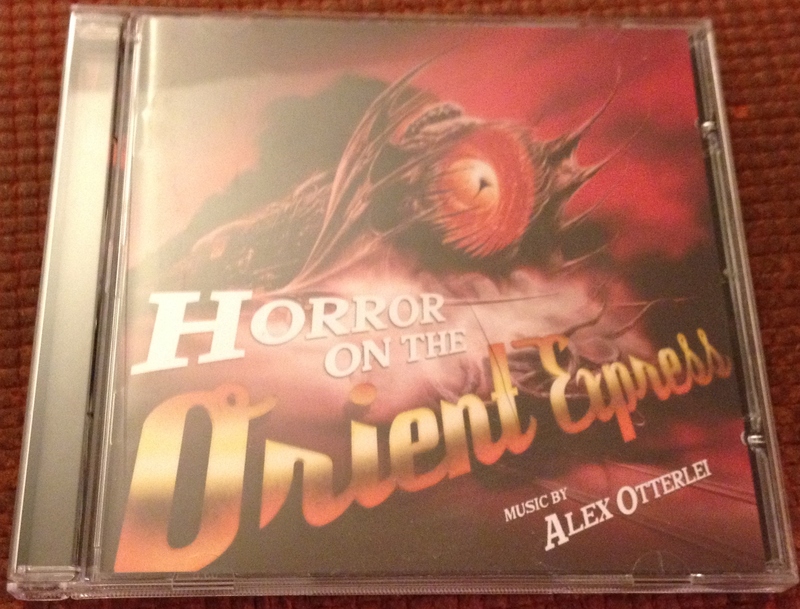 Here is the case for the Horror on the Orient Express soundtrack. Should be neat! 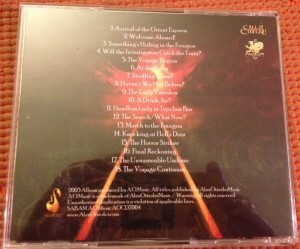 The inside of the CD case. 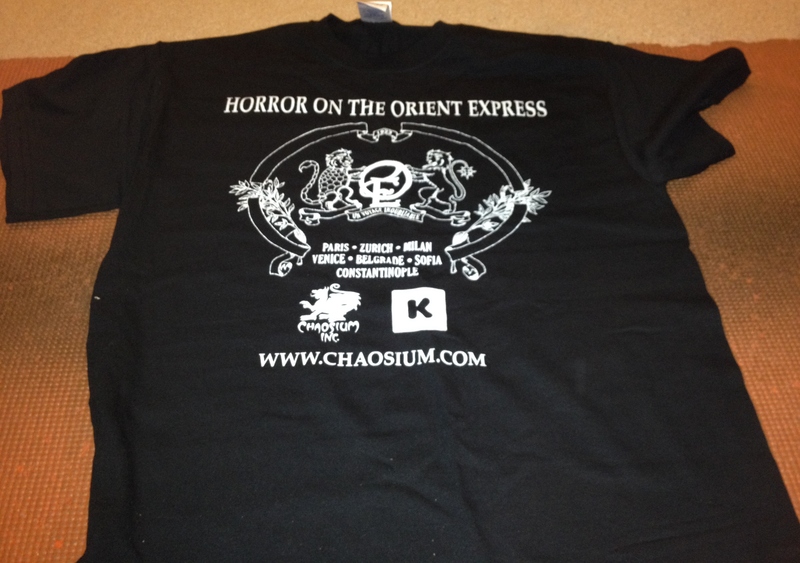 A Horror on the Orient Express t-shirt! 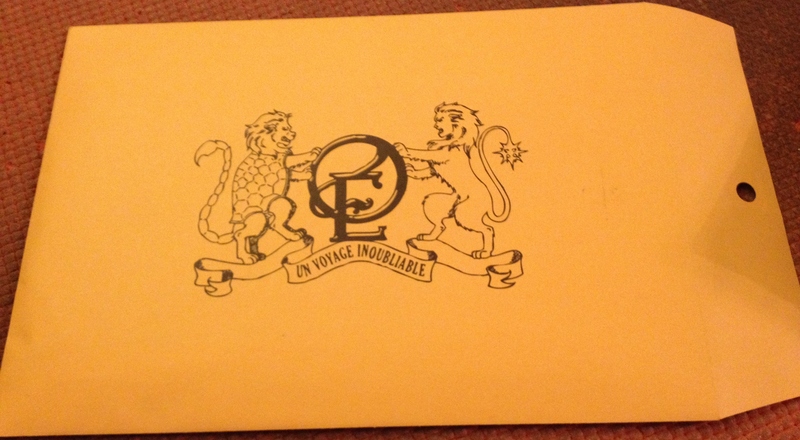 Another envelope. What could be in THIS one? 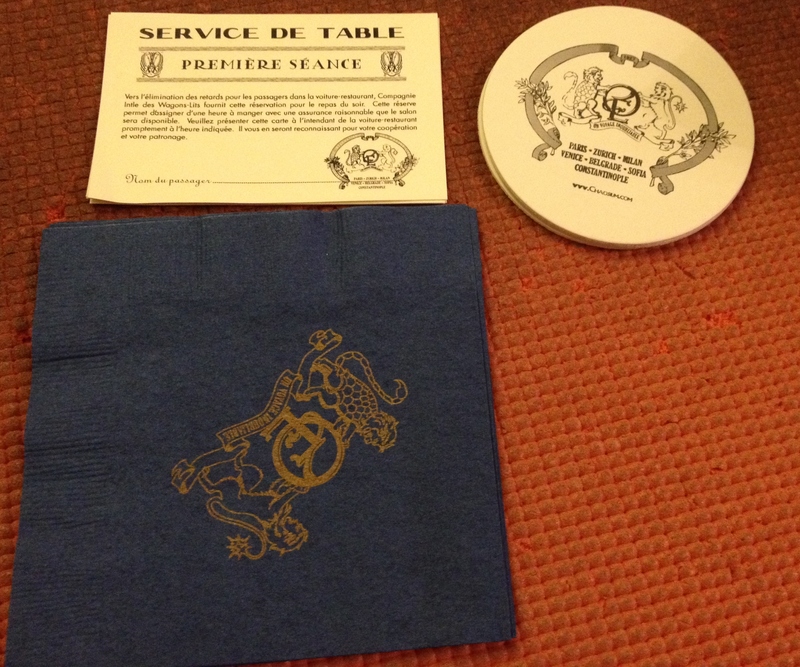 A look at one of the two unfoldable ones I received this time around. 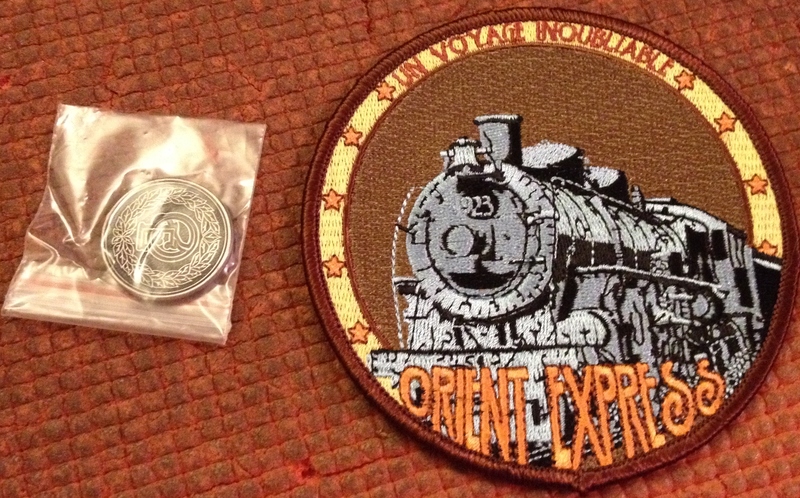 A patch and a coin. A second t-shirt. 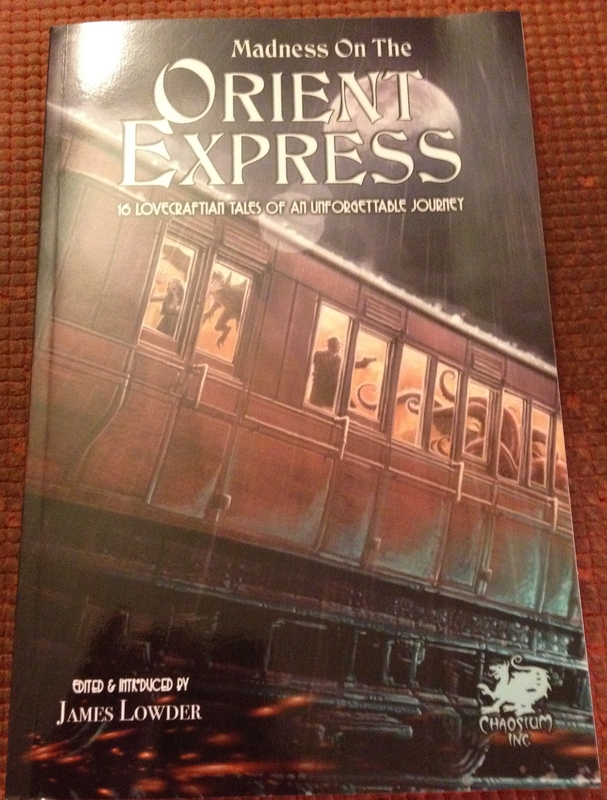 This time it’s the 1000% funded one for backers of Horror on the Orient Express. Our kitten, Angel of Music (five months old!) 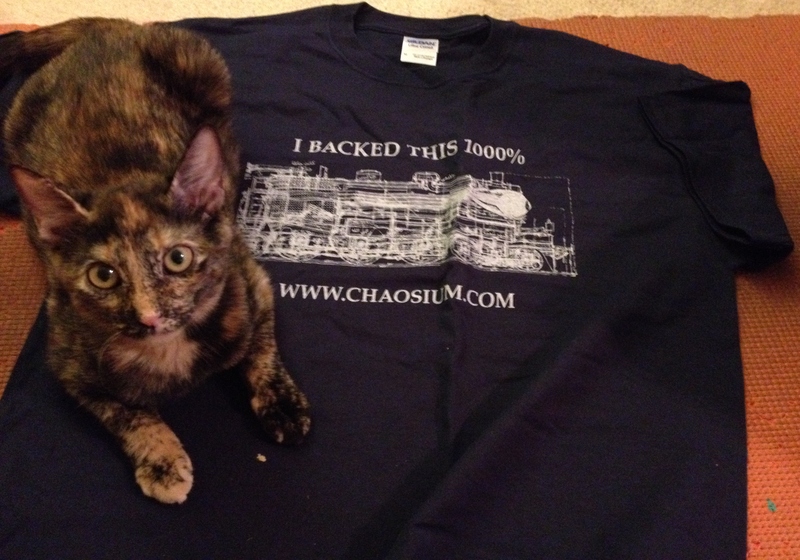 refused to get off this shirt so I just took the picture with her. She loves this thing. 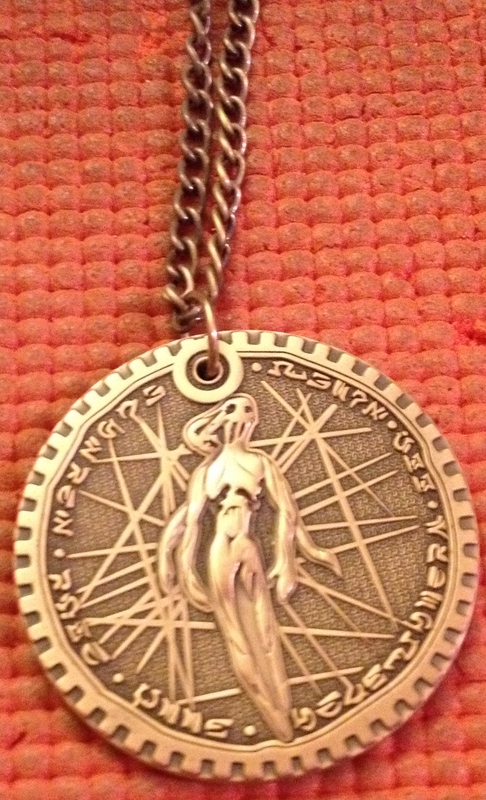 The medallion of Ithaqua, which received several photos last January, so it only gets one this time around. 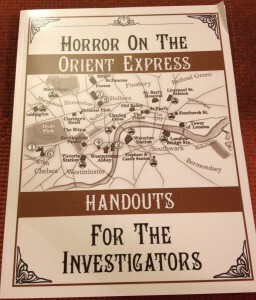 An Extra Investigator’s Handouts book. Wow, this thing is thick. FINALLY! It’s the actual box set still in shrink wrap. Gorgeous. A picture doesn’t to the size or dimensions of this justice though. 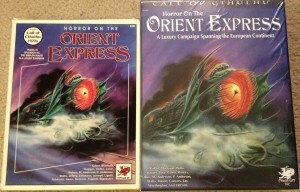 Here is the new version of Horror on the Orient Express side by side with the original dog eared version I have for Fifth Edition. I picked up my copy in the early-to-mid 90’s. I was still in High School, and for a whopping 50 bucks, I believe (big money for a teenager back then). Look at how much bigger the remake is. It’s also thicker. A LOT THICKER. Here’s a shot for comparison. Another good comparison is that this boxed set is the size of my Nagash and Khaine hardcover collections COMBINED. It is perhaps the biggest thing I own gaming wise, in terms of sheer weight and volume. So there you are, twenty four pictures of Horror on the Orient Express, and I still have another box of mugs, miniatures and more to unveil for you in 2015. Wow, this is amazing. 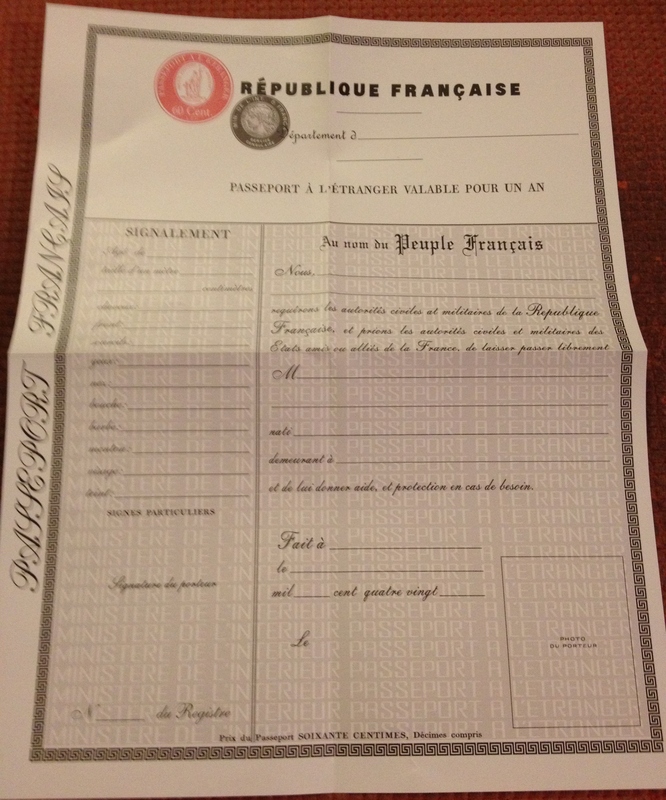 I did receive one more item with my box set: a tube containing some rolled up paper goods, but alas, they are rolled in such a way I can’t get them out of the tube without cutting it, and thus the documents within. So for right now, it’s a cat toy. 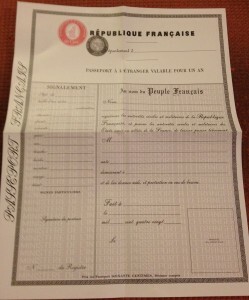 I’m going to assume that these are some of the many paper documents I covered in January. 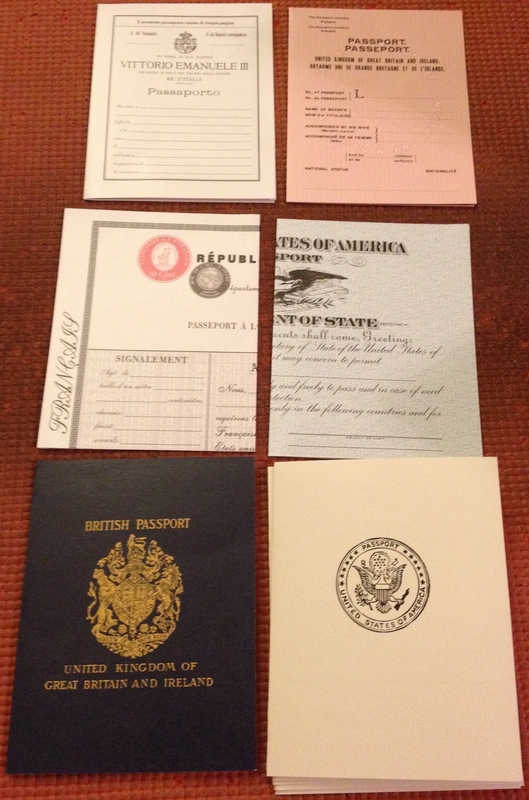 Unfortunately, if/when I get these out, they probably won’t be in condition to show off (or that Chaosium would want me to show you), so go back to the post I linked at the top of this unboxing and view them there! 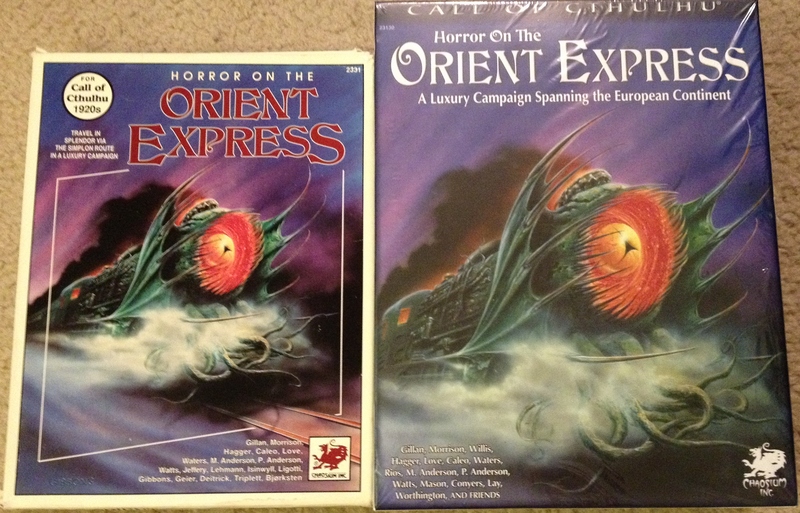 Overall, Horror on the Orient Express looks to be even more fantastic that the original copy I picked up in the 90’s. 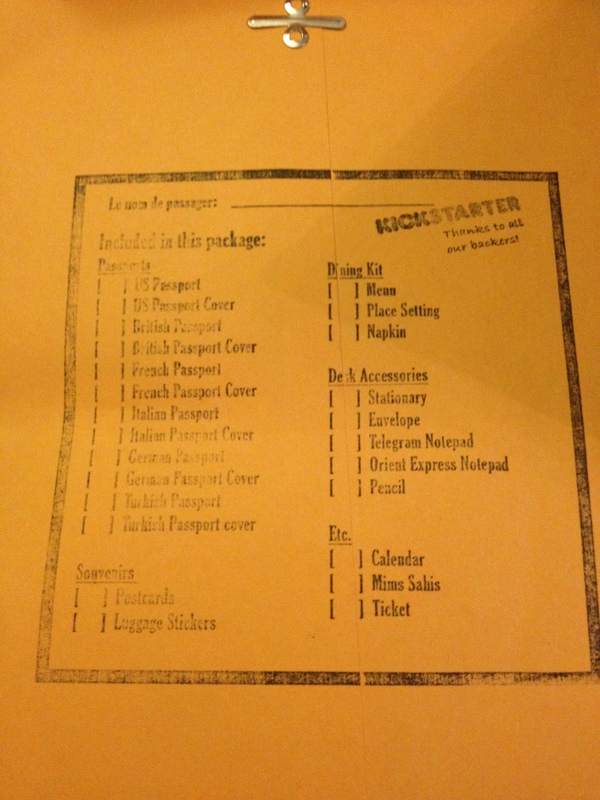 With novels, t-shirts and so many ancillary items to make the experience the most immersive campaign for perhaps ANY gaming system ever, you should be kicking yourself hard if you didn’t back this Kickstarter back in… 2012. 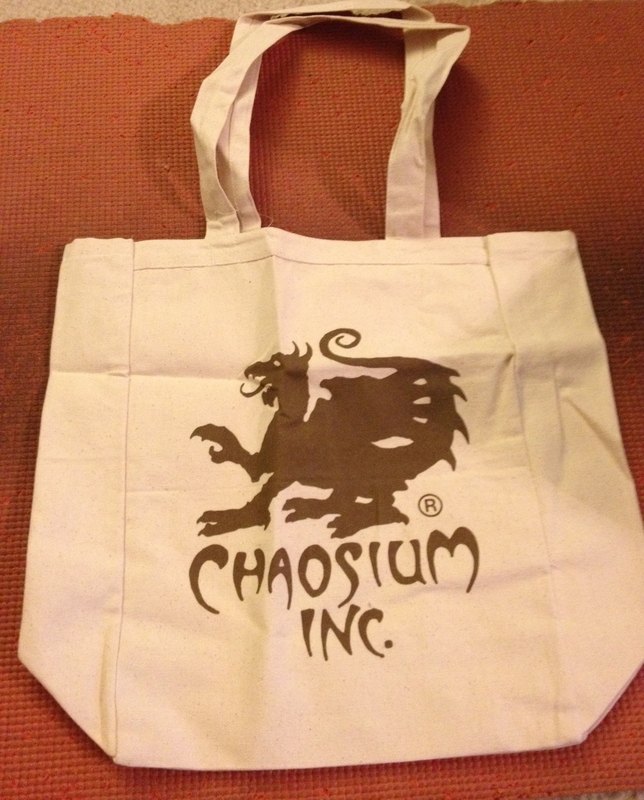 Remember you can purchase the boxed set and various add-ons over at chaosium’s website, but it’s going to cost you a lot more. Even so, it is more than worth it. It’s Horror on the Orient Express for crying out loud! 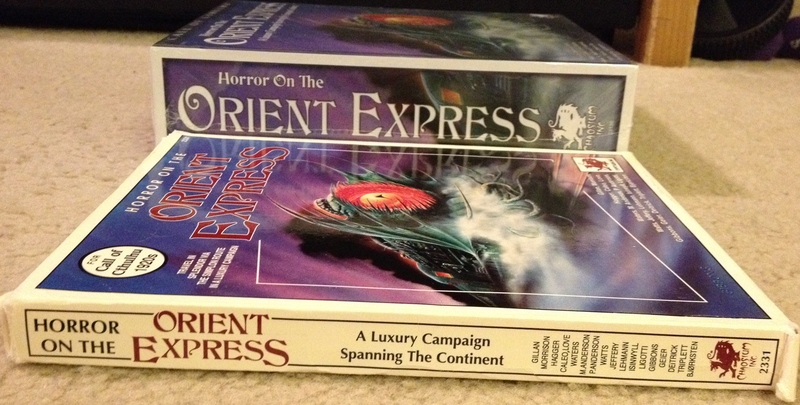 With the second half of 2015 bringing me another Horror on the Orient Express box and physical copies of Call of Cthulhu, Seventh Edition, I am pretty excited for what else Chaosium is shipping to me. 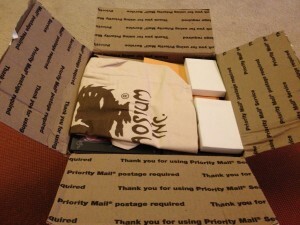 As these poackages arrive (hopefully sans Shoggoth), I’ll do unboxings of those as well. Thanks for reading! Wow! 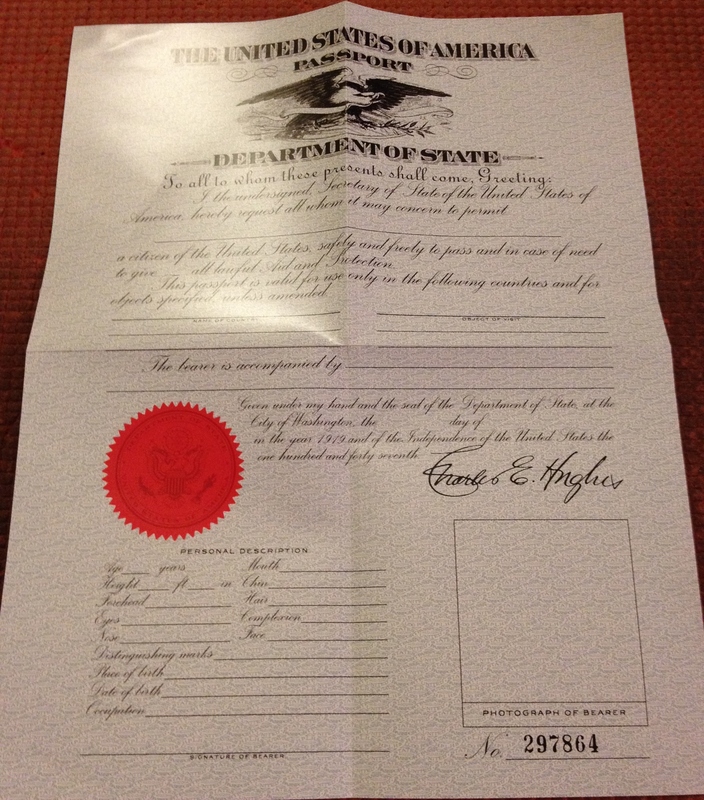 That’s a great thing to get in the mail! To say that I’m jealous is this years understatement. I hope they purchaseable thing direct from Chasoium is as good (without the extras of course)!